June 2012 – Concurrent Technologies further extends the lifecycle of the 6U VME architecture with the latest release of their VP 91x/01x processor board utilizing 3rd generation Intel® Core™ processors. The VP 91x/01x brings unprecedented performance and power efficiency to the VME form factor while maintaining compatibility with the previous generation product and offering advanced security packages. The VP 91x/01x supports the dual-core and quad-core 3rd generation Intel® Core™ i7 processors and Mobile Intel® QM77 Express chipset along with up to 16 Gbytes of ECC SDRAM. The 3rd generation Intel Core processors offer enhanced graphic and processing capabilities when compared to previous architectures operating within the same power budget. In addition, the 3rd generation Intel® Core™ processor extends itself to support compute intensive applications by providing support for OpenCL™. Responding to the increased demand for security, the VP 91x/01x is offered with or without security packages. This incorporates a number of user selectable and configurable proprietary security features deeply integrated into the board to prevent tampering and safeguard Intellectual Property. 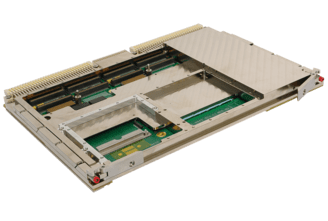 Supporting two 100MHz PCI-X PMC or two XMC x8 PCI Express® sites, with expansion for two more PMC sites via an optional expansion carrier the VP 91x/01x maintains compatibility with the VP 717/08x and VP 417/03x and offers an extensive array of rear I/O functions. 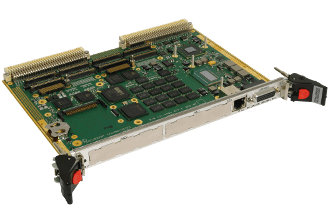 VITA 31.1 Gigabit Ethernet on a VME64x backplane enables a tried and tested method of implementing a LAN-based multiprocessor architecture by leveraging readily available Ethernet hardware, TCP/IP software, clustering and other network management tools. The VP 91x/01x addresses today’s CPU intensive processing applications within the defense, homeland security, industrial control and transportation market sectors. The VP 91x/01x is available in three temperature grades; 0°C to +55°C (N-Series), -25°C to +70°C (E-Series), -40°C to +85°C (K-Series) and two ruggedized grades; Ruggedized Conduction-Cooled -40°C to +85°C (RC), Ruggedized Air-Cooled -40°C to +75°C (RA). For ease of integration the VP 91x/01x supports many of today’s leading operating systems, including Linux®, Windows® Server 2008, Windows® Server 2003, Windows® XP Embedded, Windows® XP, Solaris™, LynxOS®, VxWorks® and QNX®.